De hamvraag: stappen of lopen in de regen? Sometimes a suitcase gets lost at the airport when you go on holiday. We have discovered where the suitcases go: if they remain at the airport for too long, they go in the dust cart. Anyway, so it seems. According to airport authorities in Christchurch, however, it was a new type of “dummy luggage” to test the system. These suitcases, mostly filled with old books and newspaper, were thrown away after they had demonstrated its value. 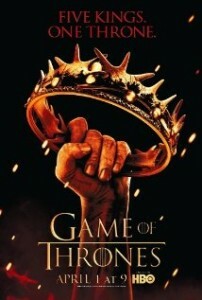 Recently, I begun watching ‘Game of Thrones‘, the TV series. As per Wikipedia: “Game of Thrones is an American medieval fantasy television series”. I discovered the TV series are based on a series of high fantasy novels by American author George R. R. Martin (now thát’s an ugly website!). A Game of Thrones is the first book in ‘A Song of Ice and Fire’. It was first published on 6 August 1996. The novel won the 1997 Locus Award, and was nominated for both the 1998 Nebula Award and the 1997 World Fantasy Award. The TV series get a 9.4 out of 10 on the Internet Movie Database (IMDb), which is pretty high… and so are my expectation on this TV series. Watch the trailer of Game of Thrones on YouTube.